This dress is a very traditional Mexican Peasant Dress. 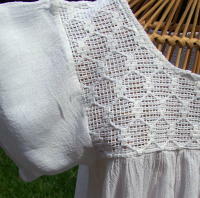 It is a very creamy white, and the lace will hide bra straps. when I say creamy I mean creamy. 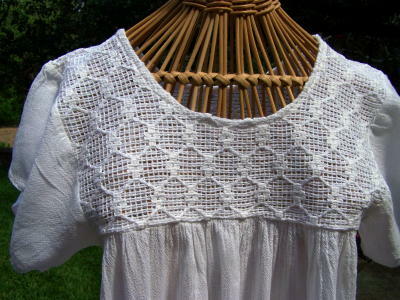 The fabric is a lightweight, not too gauzy, organic cotton. need to wear a bra (unless you live alone on an island). a pair of cream or contrasting pants. 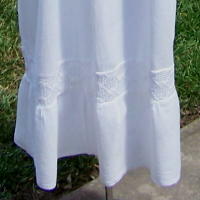 The dress above is a medium on a medium dress form. Top of lace at shoulder 14"
Top of lace at shoulder 15"
Top of lace at shoulder 17"
Top of lace at shoulder 19"
to ship this to you.